22mm Tungstan Carbide Forstner bit with 8mm shank. Total length: 92mm. Suitable for drilling the hole in the knob of Crushgrind grinder. 35mm Tungstan Carbide Forstner bit with 10mm shank. Total length: 90mm. Suitable for drilling the top hole in the main body of Crushgrind grinder. 38mm Tungstan Carbide Forstner bit with 10mm shank. Total length: 90mm. Suitable for drilling the second hole that houses the Crushgrind mechanism. 45mm Tungstan Carbide Forstner bit with 10mm shank. Total length: 90mm. Suitable for drilling the first hole that houses the Crushgrind mechanism. This 400mm long Auger bit is ideal for drilling the bore down the middle of your grinders. It drills a 25mm hole with two tungstan carbide cutters, making it especially appropriate for hard timbers. I prefer the auger bits for this task because they clear the swath so much better than any other style of drill bit. However, I start the drilling of this hole with the more rigid Forstner bit that will accurately locate the centre and then change to the Auger bit once I have a hole approximately 50mm deep. 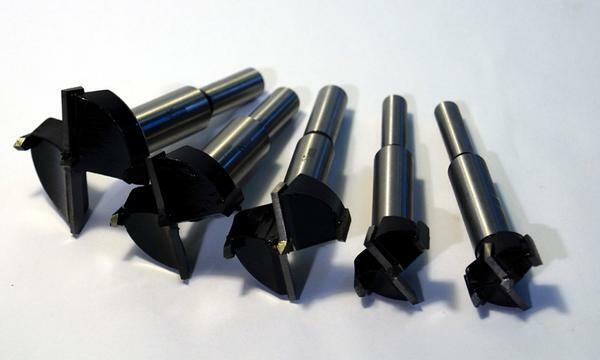 This is the full range of tungstan carbide Forstner bits needed to make a Crushgrind grinder. The set Includes: 22, 25, 35, 38 & 45mm bits. It is a more economical way to purchase all these drill bits. Click the button below to add the Tungsten Carbide Firstner Bits for Crush Grind Pepper Mills to your wish list.